Take-out can be a scary thing. You have no idea how much oil was used to cook your food. Yikes! This Chinese honey garlic chicken recipe will solve that problem. I used to think Chinese-American food was a healthy choice – hey – beef with broccoli – until a Chinese friend of mine explained that restaurants quickly deep-fry the broccoli to make it look so bright and taste so good. I hate it when I think a food is healthy and then it isn’t. Of course, I couldn’t stop eating the Chinese take-out broccoli and my own broccoli doesn’t taste nearly as good – so I should have known something was up. So I stopped ordering take-out and tried making my own Chinese inspired dishes. It isn’t easy to create them without the sodium getting out of control. So many of the sauces that are used for Chinese-American cooking are really high in sodium. You want the flavor that you find at decent Chinese restaurants but you can’t emulate it without a large amount of sodium. This recipe turns out okay (not perfect) as it relates to the amount of sodium – but not great if you want to eat more than four ounces of chicken in sauce. I love this recipe because I can cook a bunch of it and then freeze it for later meals. Reheating it is far faster than ordering take-out and waiting for it to get to your door. You also save a bunch of money and packaging. My kids love it to eat this dish with rice and I love it (you guessed it) over steamed broccoli. Do buy bone-in chicken and remove the skin for this recipe. The bone renders the chicken moist and tasty. You can find the Hoisin sauce in the Asian section of the grocery store – it is fairly common. This is great with sautéed green beans with garlic and/or cauliflower rice. How do you avoid take-out? Place chicken, breast side up, in a 6-quart slow cooker. 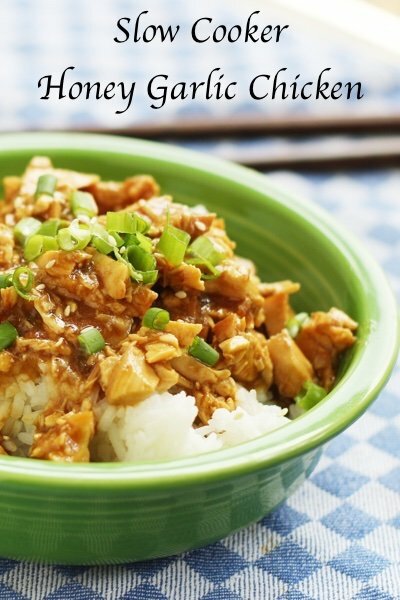 Mix honey, apricot jam, soy sauce, hoisin sauce, garlic, onion, and ¼ cup water in a small bowl. Pour over chicken breast and cook for 4-5 hours on low. Remove the chicken breasts and chop or shred meat. Pour sauce into a saucepan and add cornstarch to thicken. Boil for three minutes and pour over chicken breast. Serve with scallions and sesame seeds as a garnish. Mmmm. Sounds delicious -- I have a platter of grilled chicken thighs leftover from last night. I'm going to make your 'chinese' sauce to use as a dipping sauce for Sunday! Thighs are fatty but I couldn't resist a $1.98/lb sale at my IGA this week. Everything goes on the grill once garden starts producing! I don't overdo take-out, its the bi-weekly pizza and bi-monthly chinese. I agree typical asian food is way too salty but you can order steamed vegetables in most places. My birds/wildlife eat the leftover rice and vegetables! I realize bone-in chicken will add flavor but wondering if boneless skinless chicken Have been used and what the results are? Recipe looks great...thanks! Here is a recipe to make your own hoisin sauce. So now you have everything homemade and no question if it is safe. IFortuna-you forgot link to recipe :) sounds like a good one to have on hand. I agree with Liz....has anyone tried boneless chicken? What are the results? How might you modify? 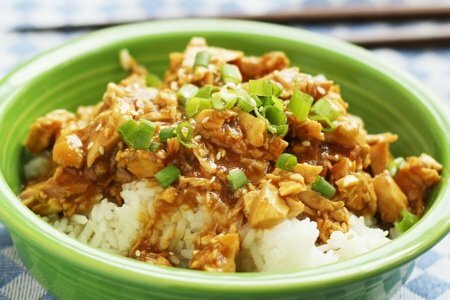 Never thought of using a slow cooker to make Chinese food - but makes sense to make the chicken tender. Sunds awesome with green beans you suggest - checking out that recipe now.